Jeev Kadgi Gashi is a very flavorful, rich gravy. In Konkani, Jeevkadgi means breadfruit. I got this recipe from a cook book written by Jaya V Shenoy. 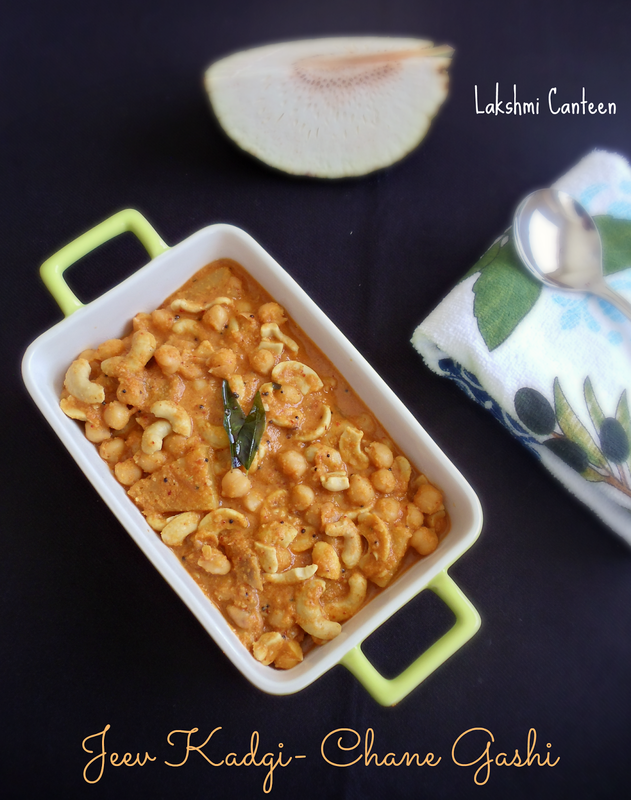 In this recipe, the bread fruit, chickpeas and cashew nuts are simmered in a wonderful roasted coconut gravy. This is the first time I making this dish and it tasted very good. I am very fortunate to find bread fruit in the farmer's market that too year round. It is one of my favorite veggie and making fritters is my favorite way of using it. 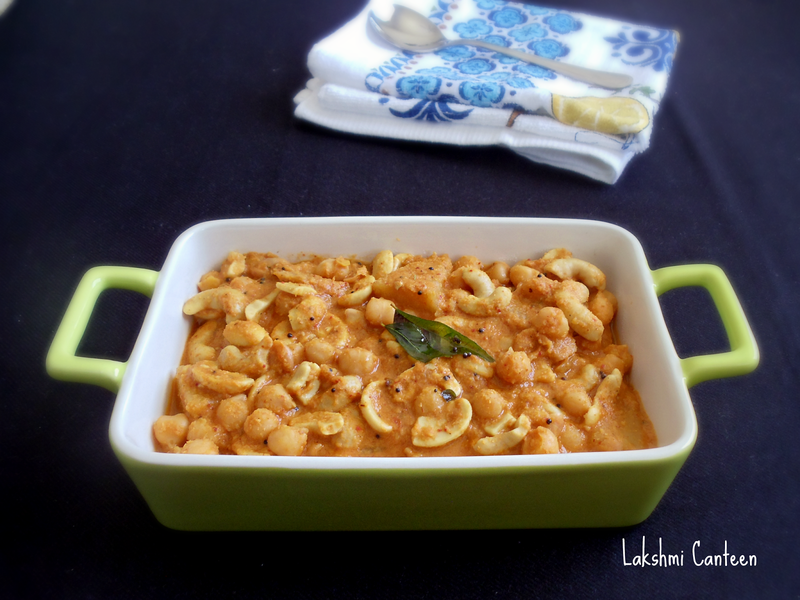 *I used the dried tender cashews. 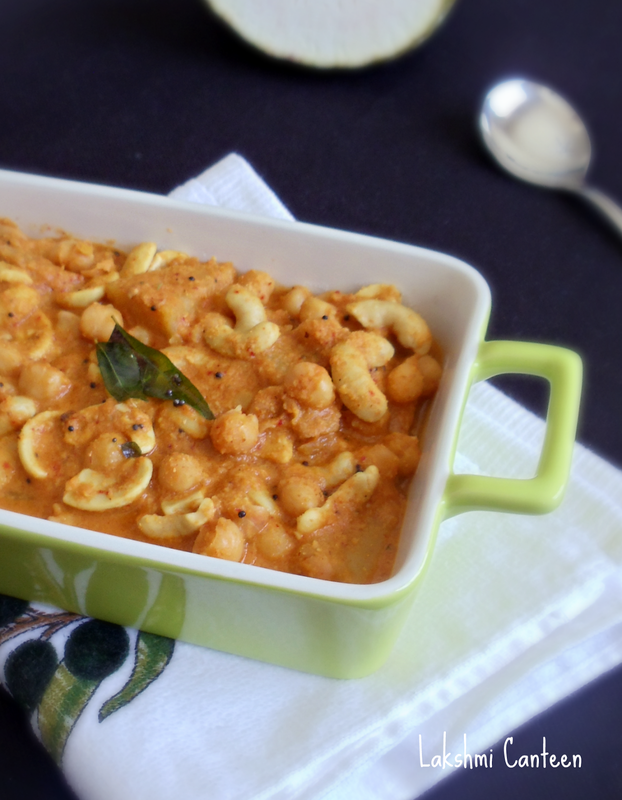 You can also substitute with regular whole cashew nut. Wash and soak chickpeas overnight. Discard the soaked water and transfer it into a pressure cooker along with water, just enough to cook it. 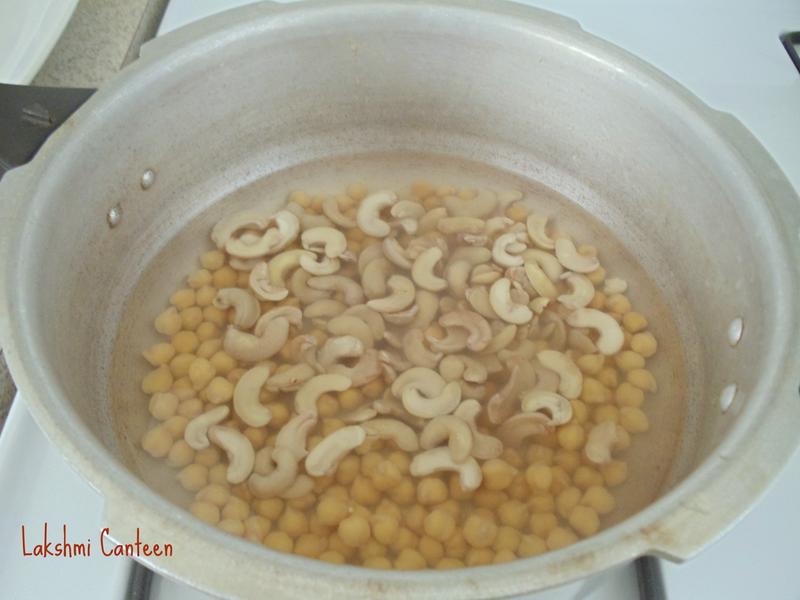 Now add the dried tender cashew nuts in hot water. 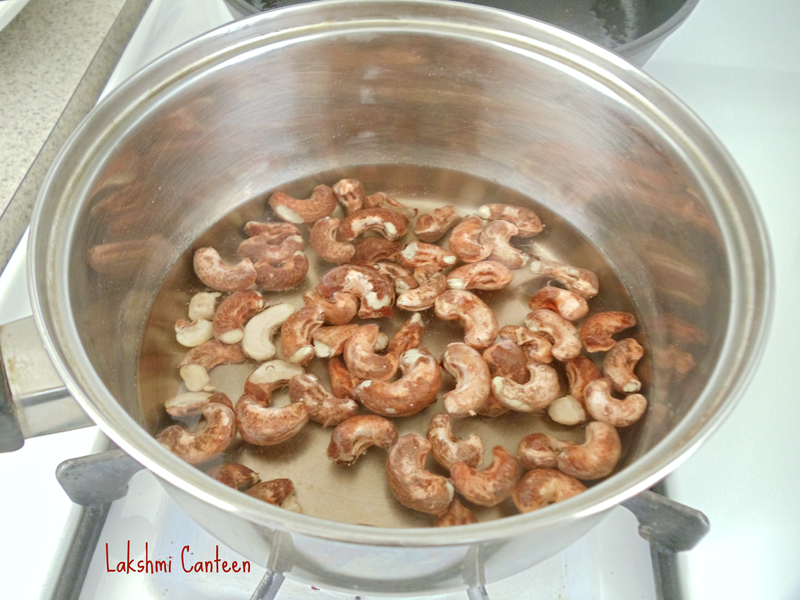 Let it sit for a while so that the skin gets softened (skip this step if you are using fresh tender cashew nut). 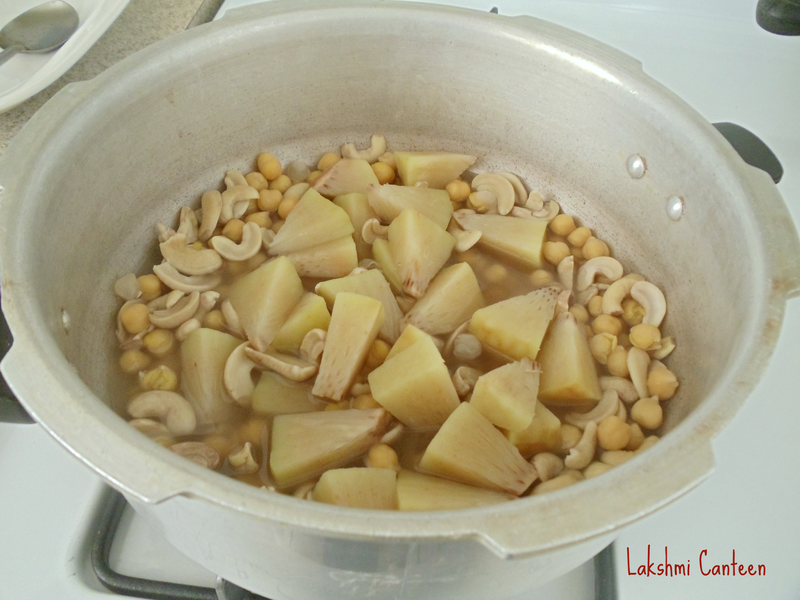 Then discard the skin and add it along with chickpeas in the cooker. Add little salt and pressure cook it for three whistles. 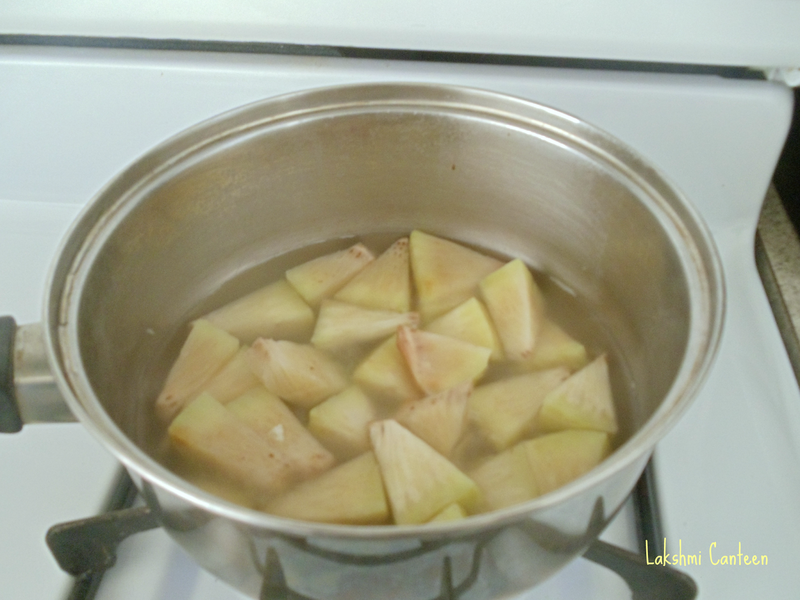 While the chickpeas are cooking, prepare the breadfruit. 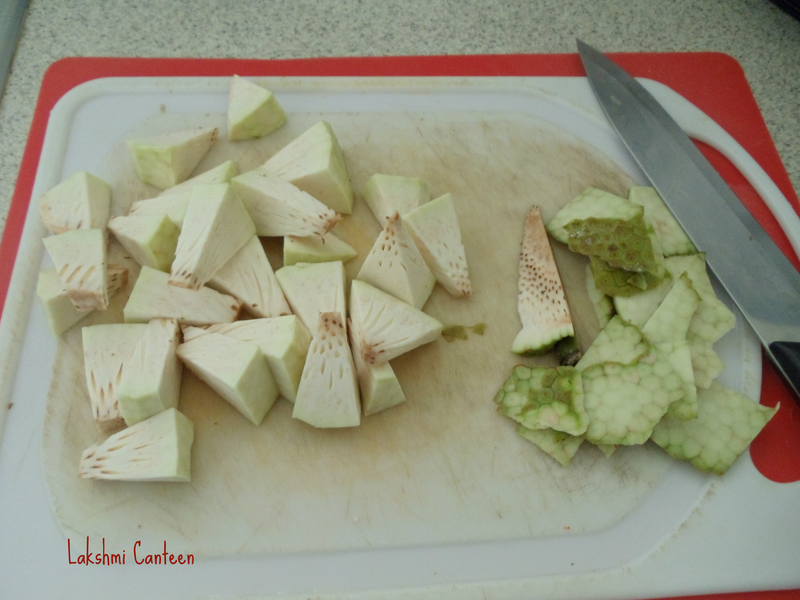 Discard the skin and cut it into small pieces. Then cook it in little water along with salt until tender but it should still hold its shape. For masala: Roast the coriander seeds and urad dal in few drops of oil until they turn light brown. Transfer it to a plate. 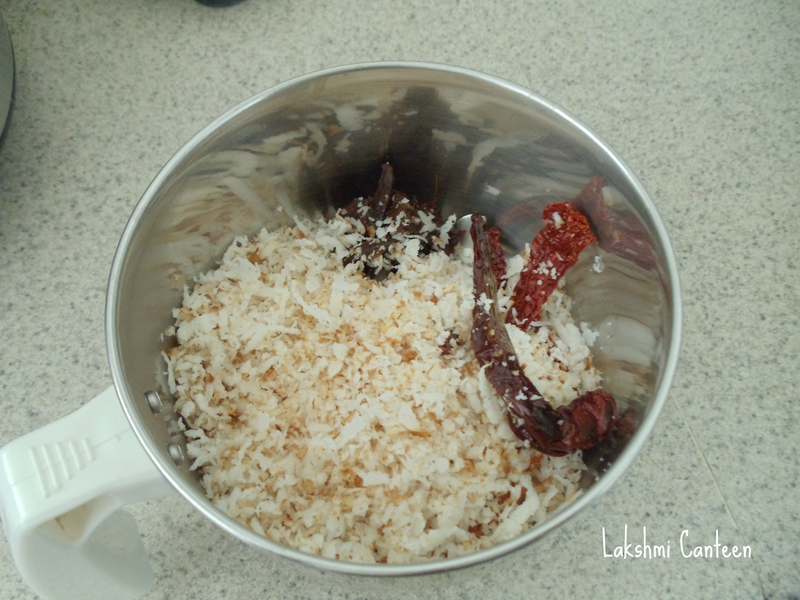 In the same pan add grated coconut and fry them until they turn light brown. Transfer it to the same plate. In the same pan, roast the dry red chillies in few drops of oil. Transfer to the same plate and allow them to cool. 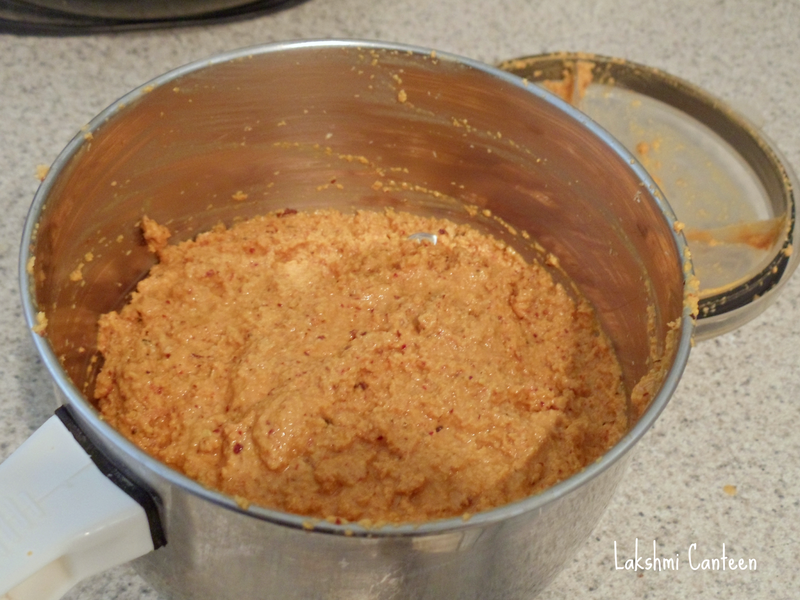 Now transfer all the roasted ingredients along with turmeric powder and tamarind into a blender. Grind to get a smooth paste. Add water as required to get a thick, smooth paste. 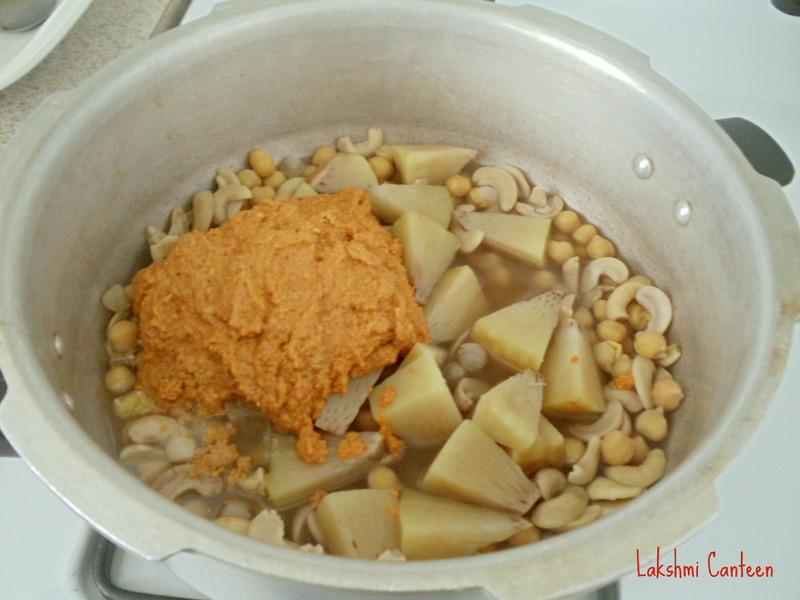 Now transfer the cooked bread fruit pieces to the cooked chickpeas - cashew nut mixture. Then add the ground masala. Mix it well and bring it to a boil. 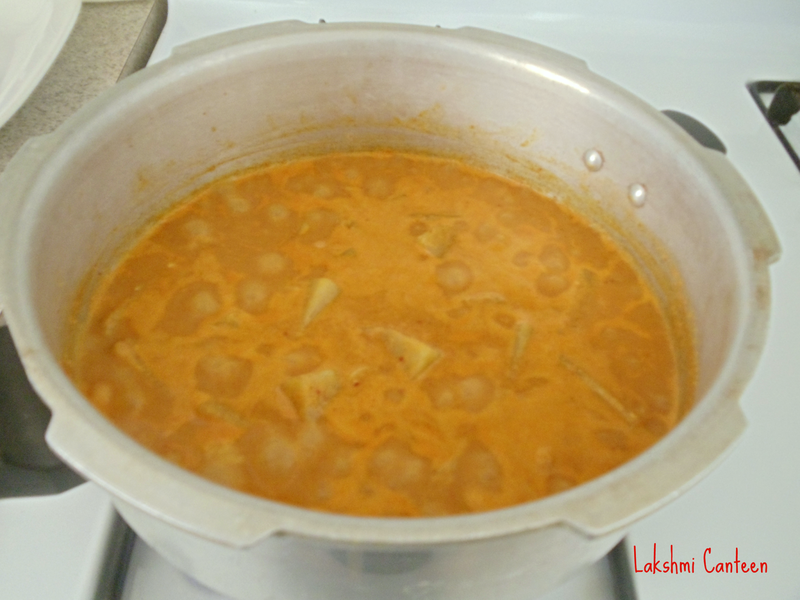 Once it starts boiling, continue heating for 3-4 minutes on a medium heat. Then turn off the heat. Finally mix in the seasoning. For Seasoning - Heat oil. Once hot, add mustard seeds. Once it splutters, add curry leaves. Then turn off the heat. Add this to the prepared gravy and mix well. Jeev Kadgi Gashi is ready!! Serve it hot along with rice. Above measurement serves 3-4 people.